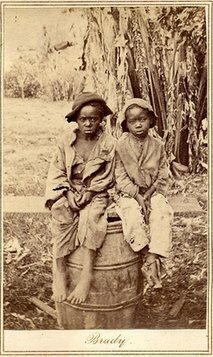 RALEIGH, N.C. – A haunting 150-year-old photo found in a North Carolina attic shows a young black child named John, barefoot and wearing ragged clothes, perched on a barrel next to another unidentified young boy. Art historians believe it’s an extremely rare Civil War-era photograph of children who were either slaves at the time or recently emancipated. 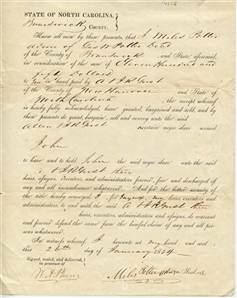 In April, the photo was found at a moving sale in Charlotte, accompanied by a document detailing the sale of John for $1,150, not a small sum in 1854. New York collector Keya Morgan said he paid $30,000 for the photo album including the photo of the young boys and several family pictures and $20,000 for the sale document. Morgan said the deceased owner of the home where the photo was found was thought to be a descendant of John. A portrait of slave children is rare, Morgan said. Stapp said the photo was probably not taken by Brady himself but by Timothy O’Sullivan, one of Brady’s apprentices. O’Sullivan took a multitude of photos depicting the carnage of the Civil War. In 1862, O’Sullivan famously photographed a group of some of the first slaves liberated after Lincoln issued his preliminary Emancipation Proclamation. Such photos were circulated in the North by abolitionists to garner support for the Union during the Civil War, said Harold Holzer, an author of several books about Lincoln. Holzer works as an administrator at the Metropolitan Museum of Art. Most of the photos depicted adult slaves who had been beaten or whipped, he said. The photo of the two boys is more subtle, Holzer said, which may be why it wasn’t widely circulated and remained unpublished for so long.